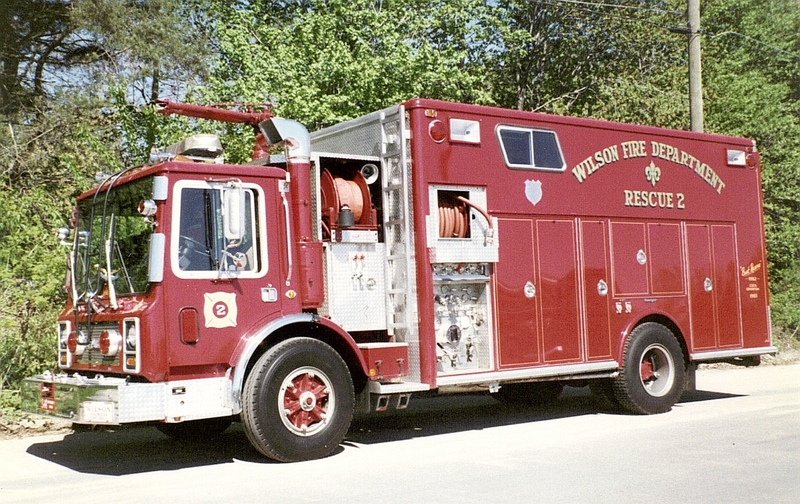 The Wilson Volunteer Fire Department was founded on May 21, 1908 at a meeting held at Windsor School District Number 1. Its formal charter was presented on May 28, 1908 and its first elected officer was Edgar L. Peck as Foreman. Mr. Frederick Kimberly was next elected as Foreman and eventually was named the first Fire Chief. On July 14, 1908 funds for the first fire equipment where appropriated and included such items as a thirty foot extension ladder, one dozen ten quart pails and one fire ax. The equipment was housed at a building on the property of the Wilson Brick Yard, owned by Mr. Young, located where Becker Circle is today. On June 8, 1909 a hand-drawn forty-gallon Badger Chemical Tank was purchased in addition to a fifty-foot extension ladder. This original piece of equipment is still operational today and is on display at our fire headquarters. The hand-drawn chemical tank was pulled by many a young volunteer and served the community well until 1924 when it was decided to upgrade fire protection. A 1923 demonstrator Republic Hose Wagon with two forty gallon booster chemical tanks was purchased from Taber Cadillac in 1924 for $1,600. During that same year, it was decided that a better fire alarm system was needed to alert the volunteer firemen of a fire call. The present alarm was the church bell atop the Wilson Congregational Church located near the corner of Faneuil Street on Windsor Avenue. Three street sirens were installed shortly thereafter, with locations on Wilson Avenue, at Hallgren's Greenhouse on Windsor Avenue and the corner of Allen Street and Windsor Avenue near the Roger Wolcott School. In 1926, Frank Greenier was elected Chief of the department. During his term, a committee was appointed to build a permanent firehouse. The committee consisted of J. Christensen, J. W Hopper, T. McManus, L. Rand, B. Foote and F. Young. The committee proposal was presented to the Wilson Fire District who agreed to fund the land purchase and building costs. Property was purchased from the Christensen and Rand farming families. The architects for the project were Donaghue and Turner, and the builder was the Peasly Construction Company. Joe Czezus, a local farmer, dug the foundation. Waldrick Becker was elected as Chief in 1930, the same year that the new firehouse was dedicated. Today our equipment is housed in a new firehouse on 50 Pine Lane. L. L. Rand's career as Chief began in 1935 and he served until 1944. 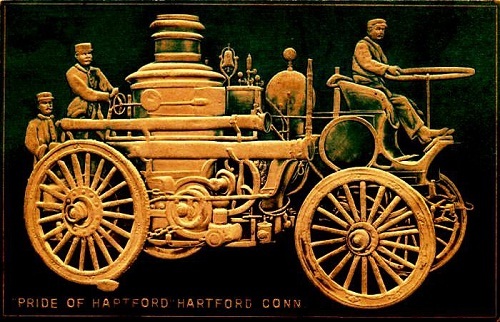 This period brought many additions to the Fire Company, which allowed better fire protection to the community. In 1937, the first engine pumper was purchased. It was a 500-gallon per minute (GPM) Diamond T, purchased from the Maxwell Company for $4,500. This engine was equipped with a two-way radio enabling communications with other local fire departments. Improved fire protection was gained with the installation of ten fire alarm boxes strategically located throughout the department's response area. The fireboxes, when pulled, would send a corresponding box number signal to the firehouse that in turn would activate the fire horn. The horn rang out that signal which the volunteers would listen for when responding, thus leading them to the correct location. Later, this system was connected to the Windsor Police Department allowing them to dispatch the fire company as necessary. The years of 1944 through 1955 saw Kenneth Christensen as Chief. Chief Christensen today has the honor of having served the longest term as Fire Chief. In 1976, he was elected Chief Emeritus and passed on with more than 57 years of active service. During his term, the department continued its upgrading of fire protection equipment. 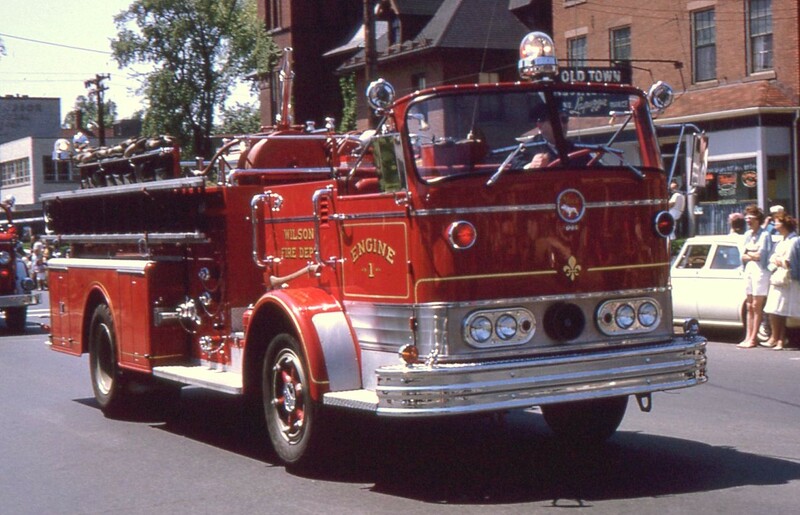 A second pumper was bought in 1952 from the Robinson Boiler Company. It was a 600 GPM Diamond T with a three hundred-gallon booster tank, purchased for $12,500. A base radio station was installed at this time enabling communications with the Fire Chief and surrounding towns. Communications were upgraded again in Anthony Jezouit's term as Chief from 1955 through 1960. A telephone ERS (Emergency Reporting System) System was installed in various locations to enable citizens to talk directly with a police dispatcher. Chief Jezouit's term also saw the beginning of a major fire prevention program. Included were: Business and Residential inspections, an annual Open House at the Fire Station, Grade School Assembly presentations, a babysitting course with assistance from the local police and health officials, and a yearly fire prevention book documenting the activities of the past year. These books were entered into local, state, national and international competition. One community friend stands out as a major contributor for these projects. Mr. Franklin P O. Potter and his family contributed uncounted man hours to make these books a success and enabled the Wilson Volunteer Fire Department to win national recognition and awards in fire prevention. Irving Christensen Sr., during his term of 1960 to 1965, continued these fire prevention programs. Also notable during these years was the implementation of a tone alert fire recall system. Volunteers who lived on the outskirts of the fire district sometimes could not hear the fire horn; the electronic tone system installed in each fireman's home eliminated this problem and allowed for prompt response to fire calls. Fire protection was further enhanced during this period with a by-law change allowing additional fire members to be added to rolls who could reside outside of the Wilson Fire District. This increased the membership rolls from thirty to thirty-five men. Ultimately, the by-laws would be revised once more so that today the Charter allows for forty regular members and five junior members. The fire auxiliary during this period was a separate entity from the regular membership of the fire department. They held their own meetings, drills and were sponsored by the local Civil Defense Department. The auxiliary was phased out and members were elected into the regular membership of the Fire Company. In 1961, a 750 GPM Mack Pumper was added at a cost of $23,000. On its qualification test, the engine pumped 1,150 gallons per minute, or 400 gallons per minute more than rated. This pumper was retired in the mid 1990's. Stephen Krilyno held the post next as Chief for the first four months of 1965 before relocating out of town. William Jezouit completed that year as Chief and remained as Fire Chief until 1970. In 1968, a Chevrolet Rescue Vehicle was added enabling us to offer better rescue and first aid services to the town and improved coverage on 1-91. In 1970, Walter Bolasevich was elected Chief and held the office for one year before moving outside of the department's coverage area. In 1970, a 1,500 GPM American LaFrance pumper was put into service and was retired in the late 1990's as new apparatus was purchased townwide. William Hallgren led the fire company from 1971 to 1975. 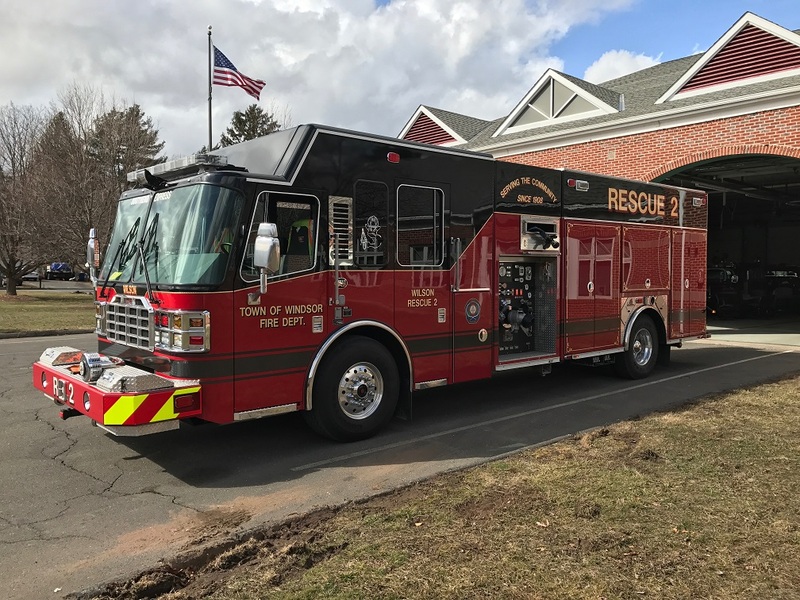 Additional support equipment was added to update the fire company's inventory and the Fire District purchased a four-wheel drive utility truck. A water tank and pump were later added to the vehicle enabling off-road capabilities for extinguishing brush and grass fires. The period of 1975 to 1979 saw Jon Andresen as company Chief. The first major piece of rescue equipment was purchased during this time period. The Hurst Tool, or "Jaws Of Life" as it is often called, was put to good use the day of delivery, when it was used twice. Once in South Windsor, and then a call immediately after for a car accident on Windsor Avenue. Needless to say, the benefits of this tool were quickly established. The next Chief was Malcolm Farrell. Finishing his term in 1984, he saw two pieces of apparatus added to the Company. A 1980 Mack Rescue/Pumper was purchased from the Ranger Corporation at a cost of $126,000. This truck has rescue and pumping capabilities, carries a supply of foam and is prepared for almost any type flammable liquid emergency in our town. 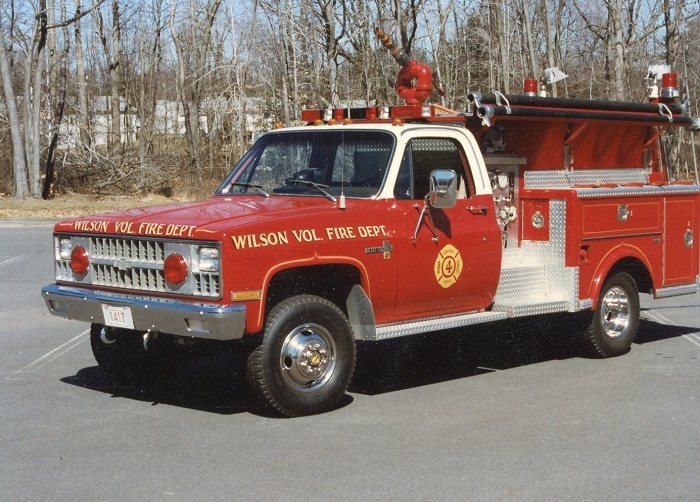 This new rescue vehicle was awarded "Best Rescue Trucks at the 1982 State Firemen's Convention. In addition, the department obtained a 1984 Chevy mini pumper. The Wilson Fire District is financing this purchase. The next chief was Roy Wimble, who served from 1984 to 1989. 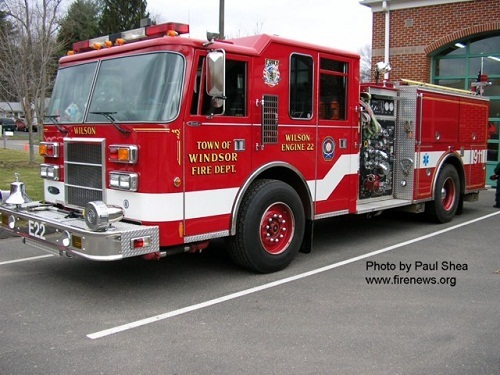 Chief Wimble continued the upgrading of equipment and service to the Town of Windsor. The Wilson Fire District was originally set up to provide sewers and sidewalks to the residents of Wilson in 1916. In 1922, rubbish pick-up began and with these revenues helped to offset some of the fire company's expenses. Presently, the Fire District still does rubbish collection and continues to supplement the Fire Company with for money for membership retention. The leader of the mid 1980's was Richard Hallgren. Gus as he is known as at the firehouse, was the last leader of the Fire Company before the consolidation. He spent many hours attending meetings with the other chief officers of the three other fire companies trying to balance the needs of the individual companies and the town. He can proudly say what resulted was a fine townwide fire department. The term of William Lewis brought some of the greatest changes to the Wilson Fire Company. During his tenure as chief he finished the wor that Chief Hallgren began to assist in the consolidation of the fire companies in town. Part of this transition included the change of title from chief to assistant chief, Bill will be the last "official" chief of the fire company. Chief Lewis was the "clerk of the works" in the building of the new Pine Lane firehouse. Although this was not his official title, he spent countless hours meeting with the contractor to ensure the new firehouse met the needs and specifications of the fire department. One of his proudest moments has to be the dedication of one of the nicest firehouses around. Bill was also a leader in the design and purchase of a 105' ladder truck. A committee of firefighters worked many weekend to create a specification that would meet the needs of the fire department. Chief Lewis took this spec and ensured the ladder desired was the ladder purchased. Also during this time a 1996 Pierce pumper was delivered, causing the retirement of Engine 1 and Engine 3. Robert Warren was the senior officer of the Wilson Fire Company until early 2001. Bob wore several hats during this period including Chief District Commissioner for the Wilson Fire District. He continued the work that Chief Lewis had done, plus managed the Fire District. The current senior officer of the Wilson Fire Company is Kenneth Rosol. His rank of deputy chief indicates more of the changes that have occurred as a result of the consolidation of the fire companies, all four-fire companies are now led by deputy chiefs. Ken brings to the position a strong knowledge of motor vehicle rescue, a nickname of "captain rescue" is very appropriate. Ken also has the fire service in his blood, his grandfather was Chief Ken Christensen. Goals of his leadership include the design/purchase of a new rescue truck and the increase of active members in the fire company. 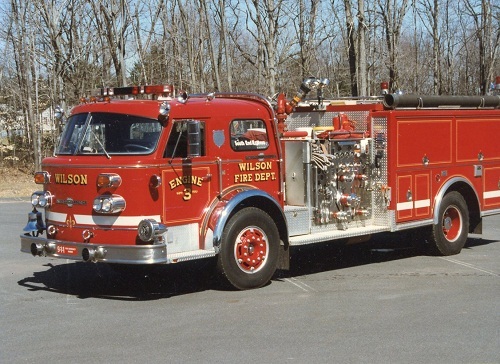 In concluding this history, the current membership would like to salute those who have contributed to the establishment and success of the Wilson Volunteer Fire Department.